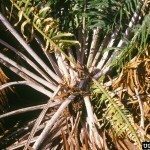 I have a Sago Palm that has been in the house for about 4 months. It is in moderate to bright light (afternoon sun is the bright light). I have allowed it to become dry before watering. The leaves are developing a yellowish color. There has been no new growth. Could someone give me some tips on what may be going on and how to go from here. I am getting ready to transfer it to a location where it will get morning sun from a southeastern exposure. Am I doing it a favor? If not, which location is best for it? I have windows with extreme afternoon sun. I try to avoid those locations for all plants. Hope someone can give me some advice. This is my first Sago Palm. I have been fairly successful with my other plants. Here is a link to help you with care and to pinpoint the yellowing leaves. It could be as simple as a watering issue, to much or to little.